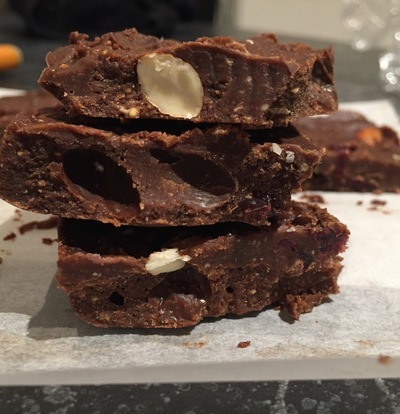 This is one of my favourite treats when I am craving chocolate but I am wanting to be a bit healthier. I love that it contains only "real" ingredients and is free from gluten, refined sugar and dairy. It also takes five minutes to whip up and only an hour to harden in the freezer. I also add whole almonds and cranberries or goji berries. You could even add frozen raspberries for a bit of zing. Add the almonds, cranberries etc and fold together. Pour in to the loaf tin and spread out. Cover tin with clingwrap and put in the freezer for at least an hour. When you're ready to eat, break it up into pieces and serve. This can last for days in the freezer but you have to keep it cold otherwise it melts easily.